This shouldn’t come as a great surprise…no, not the fact that bankers have a conscience (the article doesn’t go that far and I doubt the research would have obtained a believable response)!!! We are ALL worried about the impact of a “global recession” but banking has been in a cultural crisis for years. Financial and political “mismanagement” led to a financial crisis that, without decisive action, has created a Social crisis. Now, finding a solution IS something that is worth losing sleep over! But, on the evidence of the last few years the answers will not come from the people who brought us here…at our expense. Another global recession triggering a catastrophic banking crisis is keeping bankers awake at night, according to a survey of the world’s banking industry from the Centre for the Study of Financial Innovation (CSFI). The main cause of anxiety is the eurozone crisis, with the shock of a euro collapse liable to hit banks not just in Europe but in all major regions of the world, says CSFI’s annual Banking Banana Skins survey, produced in association with PwC. via Bankers are ‘kept awake’ by fears of new crisis | Herald Scotland. Regulatory failure or further evidence of a culture implicitly “endorsed” and underwritten by Government? Och well, so long as they say “sorry”! Unsuitable sales of this product were made to 87% of NHFA customers, prompting the largest retail fine to date from the Financial Services Authority (FSA). HSBC will pay £29.3m compensation and said it was “profoundly sorry”. via BBC News – HSBC faces £40m bill for mis-selling to elderly in care. 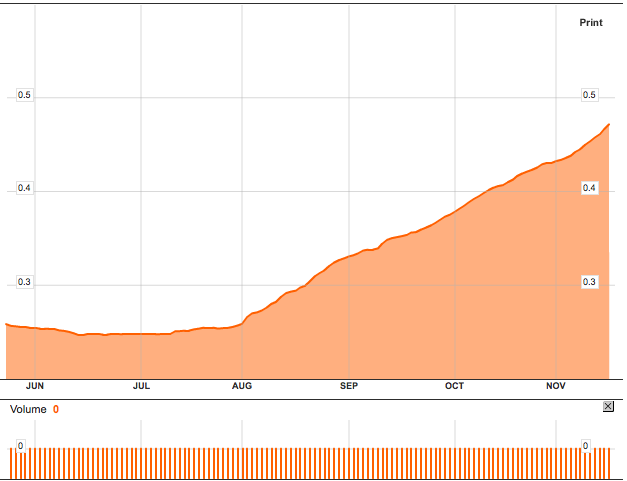 LIBOR: The territory looks familiar but no more appealing! How can “entrepreneurial spirit” and "creative destruction" flourish without nourishment? Joseph Schumpeter reinterpreted (from Marx economic theory) and popularised the expression “creative destruction” to describe the process by which established ways of doing things are destroyed from within (by new thinking, tools and processes) – at this point the scientific community may draw attention to the 2nd Law of Thermodynamics: that a system tends toward entropy (chaos or disorganisation) and consider the state of our global economy.